Made for the ultimate sports fan, you will be proud to show where your loyalty lies with this impressive Officially Licensed stool from the Holland Bar Stool Co. This retro L7C4 stool has a 5" cushion with a classic double-ring base and a cushioned back to achieve maximum comfort and support. A state of the art print process is used in applying specially formulated UV vinyl ink in numerous stages to produce a sharp, crisp, clear image to ensure a perfect reproduction of the logo. You won't find a higher quality logo stool on the market. The frame is made from commercial grade steel that is strong, durable, and triple chrome-plated to guarantee a long-lasting, rich finish capable of withstanding the abuse of your rowdiest of friends for years to come. The cushion seat and backs are of the highest quality as well, utilizing a breathable, commercial grade vinyl. At the heart of the cushion is highly-dense, US made foam that provides maximum support and will not breakdown in a couple years. If you're going to finish your bar, game room, or man cave do it right- with a logo stool made in the USA by the Holland Bar Stool Co.
Commercial grade, woven backed, marine vinyl used for the complete cushion and back. High density, high quality USA made foam used to ensure years of support. 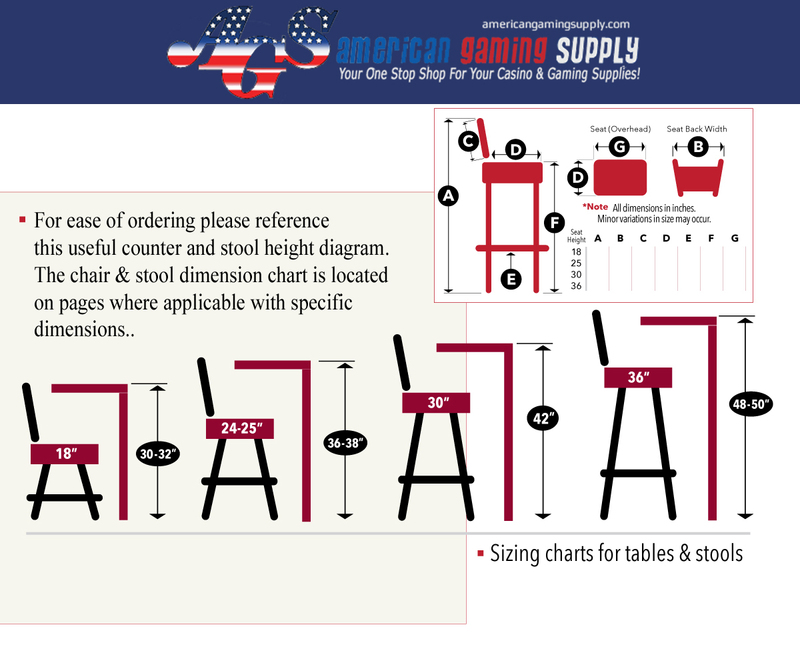 Seat Dims: 14.5" x 5"; Stool Dims: 20" x 20" x 30" (seat height) x 42" (back height) - Ideal height for bar heights 40"- 44"
Lighted L218 - 42" Black Army Pub Table by Holland Bar Stool Co.
Lighted L218 - 42" Black US Military Academy (ARMY) Pub Table by Holland Bar Stool Co.
ODL214 - Black Wrinkle U.S. Army Pub Table by Holland Bar Stool Co.
ODL214 - Black Wrinkle US Military Academy (ARMY) Pub Table by Holland Bar Stool Co.
ODL211 - Black Wrinkle U.S. Army Pub Table by Holland Bar Stool Co.
ODL211 - Black Wrinkle US Military Academy (ARMY) Pub Table by Holland Bar Stool Co.
L214 - U.S. Army Pub Table by Holland Bar Stool Co.
L217 - U.S. Army Pub Table by Holland Bar Stool Co.
L217 - US Military Academy (ARMY) Pub Table by Holland Bar Stool Co.
L214 - US Military Academy (ARMY) Pub Table by Holland Bar Stool Co.
L216 - U.S. Army Pub Table by Holland Bar Stool Co.
L216 - US Military Academy (ARMY) Pub Table by Holland Bar Stool Co.
L211 - Black Wrinkle US Military Academy (ARMY) Pub Table by Holland Bar Stool Co.
L211 - Black Wrinkle U.S. Army Pub Table by Holland Bar Stool Co.